These are the best and healthiest French fries you’ll ever eat. Forget those regular fast-food fries that are deep-fried and can contain over 20 grams of fat for a small serving. These wholesome fries are the perfect partner for a chicken meal. Serve them with drumsticks. Experiment and use any seasonings you like. For those who like spicier fries, try chili powder instead of paprika. 1. Preheat oven to 375°F (190°C). Spray a rimmed baking sheet with cooking spray. 2. 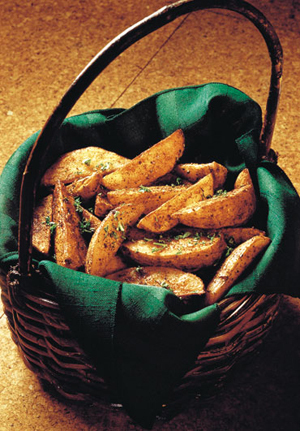 Scrub potatoes; cut each lengthwise into 8 wedges. Place on prepared baking sheet. 3. In small bowl, combine margarine, basil, garlic and parsley. In another bowl, mix the parmesan and paprika. Brush half of the margarine mixture over the potatoes. Sprinkle with half of the Parmesan mixture; bake for 30 minutes. 4. Turn wedges over; brush with remaining mixture and sprinkle with remaining cheese. Bake for 30 minutes longer, or just until potatoes are tender and crisp. Advance Preparation: Cut potatoes early in the day and leave in cold water so they don’t discolor.